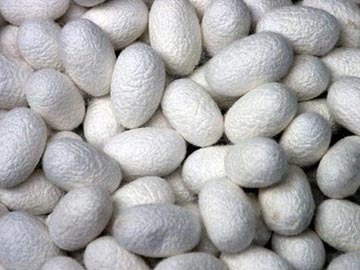 Silk is a general term given to the continuous filament (fibroin) secreted by various species of insects, especially the larvae of the caterpillar Bombyz mori, generally known as the (cultivated) silkworm. The silk from the silkworm is secreted as a viscous fluid from two glands in the lateral parts of the body. The silk filaments are glued together by sericin, which is secreted by two other glands. The double silk filament on the cocoon is known as a bave, and each single filament is called a brin. The cocoon is loosened by immersion in warm water and reeling off the softened filament(s). Silk used for clothing is generally warmer than cotton. BURNHAM, Dorothy (1980). Warp and Weft: A Textile Terminology, Toronto: Royal Ontario Museum, p. 123. TORTORA, Phyllis G. and Ingrid JOHNSON (2014). The Fairchild Books: Dictionary of Textiles, 8th edition, London: Bloomsbury, pp. 560-561. WOODWARD WENDELKEN, Rebecca (2012). 'Silk: cultivation of silk', in: Gale Owen-Crocker, Elizabeth Coatsworth and Maria Hayward (eds. ), Encyclopedia of Medieval Dress and Textiles of the British Isles, 450-1450. Leiden: Brill 2012, pp. 515-517. Digital source of illustration (retrieved 27 June 2016).